Dr. Mila Paltac’s dental team offers implant-supported dentures in Saddle Brook, NJ, to replace multiple missing teeth in the upper or lower jaw. While this treatment involves a financial investment, implant-supported dentures provide unsurpassed comfort, durability, and stability that is superior to traditional dentures. Most patients feel that the procedure is entirely worth the commitment, as they enjoy restored dental function and a beautiful new smile. Implanted-supported dentures are not only a practical restoration; they also enhance a patient's appearance. Unlike traditional dentures, which sit directly on the gums and are held in place with suction or adhesives, implant-supported dentures are secured to the jaw itself. These dentures are typically removable, but our resident implant specialist, Dr. Steven Goldstein, can make alterations, depending upon your needs and goals. Dr. David Paltac may also utilize the All-on-4® method, placing fewer implants to which the denture will attach, decreasing surgery and recovery times. Bar-retained: Dental implants are attached to a thin metal bar, which follows the curve of the patient’s jaw. Clips, affixed either to the dentures or the bar, connect the prosthetic to the implants. 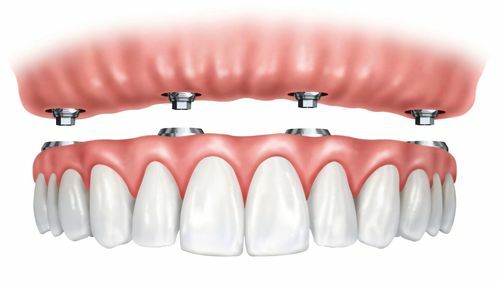 Ball-retained: Dentures are attached directly to four or five dental implants topped with a ball-and-socket joint, which align with a corresponding mechanism on the denture. Increased stability: Because traditional dentures are held in place only by suction or adhesives, they often slide and slip. With implants holding your prosthetic in place, dentures are as stable as your natural teeth. Durability: With the strength of the jawbone supporting the prosthetic, your implant-supported dentures are better able to withstand the force of chewing or speaking. As a result, with proper care, the prosthetic can last for decades. Improved speech: Speaking with dentures is often a challenge. The effort of keeping the prosthetic in place, along with unexpected shifts, often leads to slurred speech. Implant-supported dentures eliminate the need for splitting your attention between speaking and keeping the prosthetic in place. Most patients feel that the procedure is entirely worth the commitment, as they enjoy restored dental function and a beautiful new smile. Comfort: Many patients struggle to hold their dentures in place with their cheek muscles, which can quickly become exhausting. With implants securing your prosthetic, you are free to focus your attention elsewhere. Bone retention: Upon losing a tooth, the body reroutes nutrients away from the jaw to other areas for the sake of efficiency. Consequently, many patients suffer jawbone deterioration after tooth loss. Dental implants stimulate the gums and jaw in the same way a natural tooth root does, triggering a return of much-needed nutrients and subsequent bone growth. Our team of dental specialists is uniquely qualified to provide every facet of your implant-supported denture treatment at our office. Reach out today to discuss your candidacy for implant-supported dentures at a consultation. We are committed to restoring your smile through effective permanent solutions.